Andrew Johnson (December 29, 1808 – July 31, 1875) was the seventeenth President of the United States (1865–1869), succeeding to the presidency upon the assassination of Abraham Lincoln. Johnson was a United States Senator from Tennessee at the time of the secession of the southern states. He was the only Southern Senator not to quit his post upon secession. Though a slave owner and a Democrat, he supported the Union; during the war, Johnson was appointed military governor of Tennessee, and fought the rebellion there. He was perhaps the most prominent southerner supporting the Union. In 1864 he was elected Vice President on the new "Union Party" ticket with Lincoln. As president, he took charge of Presidential Reconstruction—the first part of Reconstruction which lasted until the Radical Republicans gained control of Congress in the 1866 elections. His conciliatory policies towards the South, his hurry to reincorporate the former Confederates back into the union, and his vetoes of civil rights bills embroiled him in a bitter dispute with the Radical Republicans. The Radicals in the House of Representatives impeached him in 1868; he was the first President to be impeached, but he was acquitted by a single vote in the Senate. 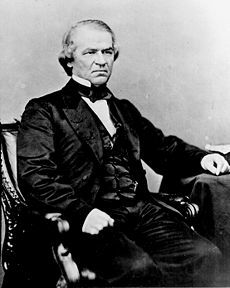 Andrew Johnson was born on December 29, 1808, in Raleigh, North Carolina. His father, Jacob died in 1811, rescuing two drowning men from an icy river. Jacob succumbed soon afterward from exhaustion and hypothermia. After his father's death he was raised by his mother, who worked as a spinner and weaver to support her sons. Johnson worked as a tailor’s apprentice from the age of 14, then opened his own shop in 1827, after his family moved to Greeneville, Tennessee. He never attended any type of school; he credited his wife, Eliza McCardle Johnson with teaching him to read and write. The Johnsons had five children, three boys and two girls. His tailoring business did well and he bought property in the town. He became a leader in the neighborhood. He often held community meetings at his tailor shop to discuss politics and public affairs. Johnson was elected to his first political office, town alderman, in 1829. He rose in politics quickly. He served as mayor of Greeneville and in both houses of the state legislature. In 1843, he was elected to the first of five terms in the U.S. House of Representatives. He was elected governor of Tennessee in 1853 and a U.S. senator in 1857. He was serving in the Senate at the outbreak of the Civil War in 1861. When Abraham Lincoln was elected president in 1860, Tennessee, as all the other southern states prepared to secede from the Union. The main dispute between North and South was over slavery. Johnson was loyal to the institution of slavery. However, he was even more loyal to the United States. Johnson traveled all Tennessee, trying to persuade the people not to take Tennessee out of the Union. He faced crowds of people who had once been his friends but were now his enemies, telling them that secession was treason. Johnson did not give up until the last hope of saving his state was gone. Tennessee seceded in June 1861. Johnson stayed in Washington, D.C., as the loyal senator from a disloyal state. He had been a lifelong Democrat, he now allied himself with the Republicans, the party of Lincoln. After the Union Army recaptured parts of Tennessee in early 1862, Lincoln was impressed by Johnson's courage and loyalty. At Lincoln's request, Johnson assumed the position of state's military governor. He kept this position almost to war's end. When Lincoln ran successfully for re-election in 1864, he chose Johnson as his vice president. The two men won the election handily. But within a month of being sworn into office, Lincoln was dead, and Johnson became the 17th president of the United States. He became President of the United States on April 15, 1865, upon the death of Abraham Lincoln. He was the first Vice President to succeed to the U.S. Presidency upon the assassination of a President and the third to succeed upon the death of a President. Johnson's Presidency was dominated by the attempt to reintegrate the South into the Union. Johnson's basic policy was a continuation of Lincoln's: The South would quickly be readmitted with no retribution. Johnson forced the French out of Mexico by sending a combat army to the border and issuing an ultimatum. The French withdrew in 1867, and their government quickly collapsed. In 1867, Secretary of State William H. Seward negotiated the purchase of Alaska from Russia on April 9, 1867, for $7.2 Million. Critics sneered at "Seward's Folly" and "Seward's Icebox." Seward also negotiated to purchase the Danish West Indies, but the Senate refused to approve the purchase in 1867. Supported by Johnson, Seward insisted that Britain pay for damages caused by the Alabama and other cruisers of the Confederate States of America that had been built and outfitted in British ports. In January 1869, almost at the end of Johnson’s term, a settlement of the claims was submitted to the Senate for ratification. In April 1869, the Senate rejected the convention. Still stung by the assassination, Johnson initially was vindictive toward the defeated Confederate leaders, who also represented the privileged class. Shortly after his inaguration, Johnson and Secretary of War Edwin M. Stanton captured and imprisoned officials of the Confederacy. “Treason must be made infamous and traitors must be impoverished,” President Johnson said. His position won him the approval of the militant wing of the Republican Party, called the Radical Republicans. However, Johnson soon changed his opinion and dropped punitive activities for more constructive tasks. Basing his program for Reconstruction of the Union on the policy of conciliation developed by Abraham Lincoln, Johnson started a process to restore the former Confederate states to full membership in the Union. First, the white residents were to take an oath to uphold the Union. When 10 percent of a state’s 1860 voting population had taken the oath, they could elect a state government. When that government wrote a constitution recognizing the end of slavery, it could apply to Congress for the power to once again elect senators and representatives to the U.S. Congress. The job was simplified by the fact that Johnson, like Lincoln, denied that the states had ever broken away from the Union and by the fact that Congress was adjourned from April to December 1865. On May 9, 1865, Johnson recognized a Reconstruction government in Virginia. On May 29, he issued two proclamations. One was a proclamation of amnesty, which restored full citizenship to many former Confederates if they would swear allegiance to the Union. The other proclamation dealt with the restoration of civil government in North Carolina. The “loyal” people of the state were to elect delegates to a convention, which was to make constitutional and other changes needed to restore the state to the Union. Johnson issued similar proclamations for other seceded states. In compliance with Johnson’s wishes, the Southern state conventions repealed the ordinances of secession, abolished slavery, and, with the exception of Mississippi, ratified the 13th Amendment to the U.S. Constitution, which prohibits slavery in the United States. The conventions also repudiated state debts contracted during the war. In line with a suggestion of Lincoln’s, Johnson’s Reconstruction program included a recommendation that a few highly qualified blacks be given the vote, but none of the Southern states followed his recommendation. Instead, new state laws, known as the Black Codes, limited the civil rights of blacks and placed many economic restrictions on them. By the time Congress convened in December 1865, all the Southern states except Texas had established Reconstruction governments in accordance with Johnson’s program. However, Congress was not pleased. The Radical Republicans were angered by the Black Codes and by the reemergence into public life of former Confederate leaders. Representative Thaddeus Stevens of Pennsylvania, the leader of the congressional Radicals, attacked the president’s policies. Stevens declared, “The punishment of traitors has been wholly ignored by a treacherous Executive….” A long battle between the president and Congress began. The Radicals in Congress set up a Joint Committee on Reconstruction. 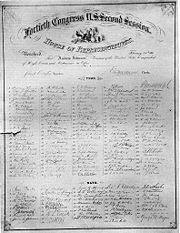 In February 1866, Congress passed a bill to enlarge the scope of the Freedmen’s Bureau, which Congress had established in March 1865, to help the freed slaves. Johnson vetoed the bill. However, in July 1866 a second bill was enacted over his veto. In April 1866, the first Civil Rights Act, which was designed to nullify the Black Codes by guaranteeing equal civil rights to blacks, was also passed over Johnson’s veto. Harper's Weekly illustration of Johnson's impeachment trial in the United States Senate. In February 1868, Johnson notified Congress that he had removed Edwin Stanton as Secretary of War and was replacing him in the interim with Adjutant-General Lorenzo Thomas. This violated the Tenure of Office Act, a law enacted by Congress on March 2, 1867, over Johnson's veto, specifically signed to protect Stanton. Johnson had vetoed the act, claiming it was unconstitutional. The act said, "…every person holding any civil office, to which he has been appointed by and with the advice and consent of the Senate … shall be entitled to hold such office until a successor shall have been in like manner appointed and duly qualified," thus removing the President's previous unlimited power to remove any of his Cabinet members at will. Years later, in the case Myers v. United States in 1926, the Supreme Court ruled that such laws were indeed unconstitutional. The Senate and House entered into debate. Thomas attempted to move into the war office, for which Stanton had Thomas arrested. Three days after Stanton's removal, the House impeached Johnson for intentionally violating the Tenure of Office Act. On March 5, 1868, a court of impeachment was constituted in the Senate to hear charges against the President. William M. Evarts served as his counsel. Eleven articles were set out in the resolution, and the trial before the Senate lasted almost three months. Johnson's defense was based on a clause in the Tenure of Office Act stating that the then-current secretaries would hold their posts throughout the term of the President who appointed them. Since Lincoln had appointed Stanton, it was claimed, the applicability of the act had already run its course. 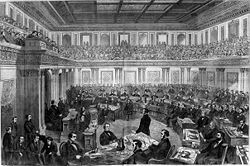 There were three votes in the Senate: One on May 16, 1868, for the 11th article of impeachment, which included many of the charges contained in the other articles, and two on May 26, for the second and third articles, after which the trial adjourned. On all three occasions, thirty-five Senators voted "Guilty" and nineteen "Not Guilty." As the United States Constitution requires a two-thirds majority for conviction in impeachment trials, Johnson was acquitted. A single changed vote would have sufficed to return a "Guilty" verdict. The decisive vote had been that of a young Radical Republican named Edmund G. Ross. Despite monumental pressure from fellow Radicals prior to the first vote, and dire warnings that a vote for acquittal would end his political career, Ross stood up at the appropriate moment and quietly announced "not guilty," effectively ending the impeachment trial. In May 1868, while the impeachment trial was still in progress, the Republicans nominated Ulysses S. Grant as their presidential candidate. Johnson hoped to receive the Democratic nomination, but he did not actively seek votes. At the Democratic convention in July 1868, Johnson needed 212 delegate votes to be nominated. He never got enough, and through several ballots, his support dwindled away. Finally the convention chose Governor Horatio Seymour of New York as its candidate. Johnson and Congress continued to battle each other to his last day in office. He vetoed Reconstruction bills, and Congress promptly overrode his vetoes. In his last annual message to Congress, Johnson criticized its Reconstruction program, and in his final address, made as he prepared to leave the White House, he bitterly attacked the Radical Republicans. Johnson was an unsuccessful candidate for election to the United States Senate in 1868, and to the House of Representatives in 1872. However, in 1874 the Tennessee legislature did elect him to the U.S. Senate. Johnson served from March 4, 1875, until his death near Elizabethton, Tennessee, on July 31, that same year. He is the only President to serve in the Senate after his presidency. Internment was in the Andrew Johnson National Cemetery, Greeneville, Tennessee. Andrew Johnson National Cemetery is now part of the Andrew Johnson National Historic Site. 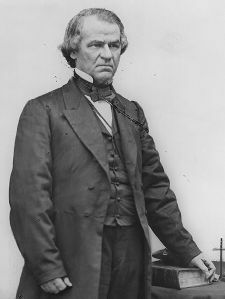 In his lifetime Andrew Johnson, the son of a tailor, occupied every major non-judicial elected office in the American political system—city councilman, mayor, state representative, state senator, Governor, Representative, Senator, Vice-President, and President. He is the only person to have held all of those positions. He was the only Vice President known to be the target of an assassination plot. Speaking to a crowd of African Americans in Nashville during the 1864 campaign, he referred to himself as "the Moses" of the black people. DeWitt, D. M. The Impeachment and Trial of Andrew Johnson. Madison: State Historical Society of Wisconsin, 1967. Milton, George Fort. The Age of Hate: Andrew Johnson and the Radicals. Hamden, Conn.: Archon Books, 1965. Patton, James Welch. Unionism and Reconstruction in Tennessee, 1860-1869. Gloucester, Mass. : P. Smith, 1966 . Rhodes, James Ford. History of the United States from the Compromise of 1850 to the McKinley-Bryan Campaign of 1896. 8 vol., Port Washington, NY: Kennikat Press, 1967; v.6. : 1866-1872 period. Vice Presidential biography. From the Senate Historical Office. This page was last modified on 18 November 2016, at 20:14.